Find your apartment in Toronto with a dedicated, hard-working rental agent. Planning on renting an apartment in Toronto? You’ve likely been warned that this city is very expensive to live in. It’s true that this is one of the more pricey places to rent in Canada. Toronto, though, has lower average rent prices than one might think. What are the average rent prices in Toronto, Canada? Convert that to American dollars and it’s around $725, $855, or $1,000 per month respectively (depending on the exchange rate). That’s comparable to some of the cheapest big cities in the U.S. Non-official sources report somewhat higher prices, however. And check out this helpful map, which shows average monthly rent prices for one- and two-bedroom units throughout Toronto (along the subway). Click the image for a higher resolution version! There’s some protection against sudden, rapid hikes in rent. You must be given 90 days’ written notice before the rent increases. Also, rent increases can only happen every 12 months. Rent for some apartments can increase only at the required "guideline" rate, which is usually somewhere between 1 and 2.5 percent. In 2016, the rent increase guideline rate is 2 percent. Your landlord may increase your rent beyond that, but it must be approved by the Landlord and Tenant Board. This guideline doesn’t apply to some new rental buildings, including newly converted rentals (after 1991). Despite these controlled rates, rent prices are still increasing a great deal as new condos and buildings are being put up. 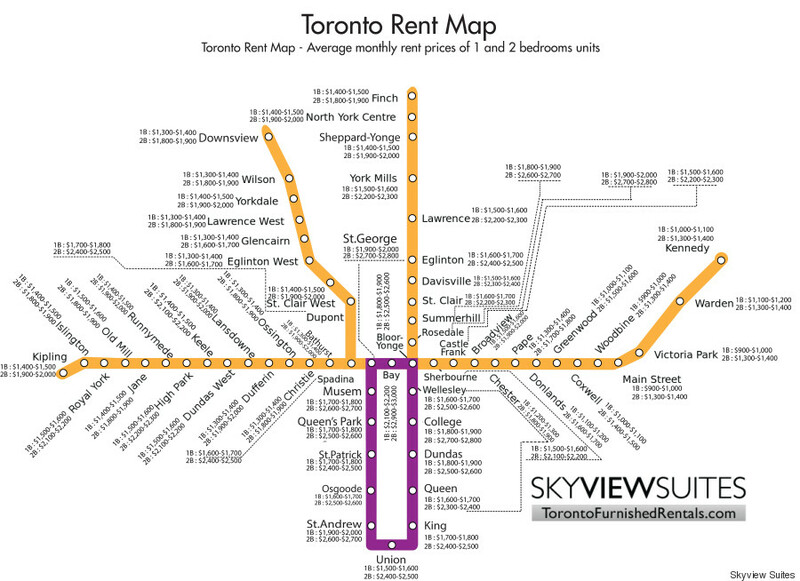 So Toronto rent prices are fairly reasonable, and some are very controlled. If the rent is so reasonable, why is Toronto considered to be an expensive city? Some consider Toronto to be, aside from one of the most expensive places in Canada, also one of the world’s most expensive cities to rent property in. But when you take a close look at the numbers, Toronto rent prices don’t take up the majority of income. It doesn’t even come close to cities like Beijing, where the average rent takes up 123 percent of the average salary. Compared to New York City, the rent in Toronto, Ontario, is much more reasonable for the average apartment. Unlike in most other cities across the world, renting in Toronto is affordable; it’s everything else in the cost of living indexes that make this city expensive. If you exclude the cost of rent in your equations, the city ranks 12th in the world among the most expensive cities to live in. That being said, it’s still a burgeoning metropolis. You can easily find a listing that’s well beyond the price range of a normal individual when you’re looking at apartments. Condos and townhouse options especially are often out of reach, often due to the rules restricting price increases not applying to newer buildings. The best bet for many looking to move to the area may be to find a room or flat in a house or a cheap loft in an older building that’s been renting out since before 1991, but those are very hard to come by. Also, newer or refurbished apartments often just have more appeal than their older, rent-controlled counterparts. Moving to Toronto, Ontario? Inside you'll find detailed tips, advice and helpful resources to prepare for relocating to Toronto. Use this guide to discover the best Toronto neighborhoods for you so that you can find an apartment in a really great area of this "city of neighborhoods." How much should you expect to spend when you’re relocating to Toronto, Canada? Learn the cost-of-living facts, such the prices for rent, food, and more! Are you planning on renting in Toronto, Ontario? Do you know what you should expect to pay when you move up there? You may be surprised by the rent prices. Use our top tips for your search as you’re trying to find apartments in Toronto. These are some of the important things you should know about renting here.